THE government is keen to see a three-way merger of Bank Islam Malaysia Bhd, Bank Simpanan Nasional Bhd (BSN) and Bank Muamalat Malaysia Bhd, sources say, in a move that could create the country’s largest standalone Islamic bank. “It’s an idea that’s being thrown at them from the top. The banks are prepared to look at it, but it’s not something that will happen so soon, if at all. Definitely not before the next general election,” one source tells The Edge. The three lenders have yet to embark on any merger discussions, the sources say. A union of the three would create a banking entity with total assets of about RM111.6 billion, based on their last available financial data. It is unclear why the government is keen on a merger of these three particular banks, apart from the fact that it would spur consolidation in the local Islamic banking space, which is deemed too crowded. In Malaysia, there are currently 16 Islamic lenders, two international Islamic banks and several development financial institutions (DFI) — such as BSN — that also undertake Islamic banking. Bank Islam, the largest of the three by asset size, declined to comment for this story, while BSN did not respond to requests by The Edge. “Currently, there are no talks between the parties, but if the shareholders see value, this may be explored in the future,” Bank Muamalat CEO Datuk Mohd Redza Shah Abdul Wahid says when contacted by The Edge. Bank Muamalat’s shareholders are DRB-Hicom Bhd (70%) — a conglomerate controlled by prominent tycoon Tan Sri Syed Mokhtar Albukhary — and Khazanah Nasional Bhd (30%). BSN is wholly owned by the Ministry of Finance, while Bank Islam is wholly owned by public-listed BIMB Holdings Bhd, which in turn is 52.5% held by Lembaga Tabung Haji. This certainly won’t be an easy merger to negotiate considering the heavyweight shareholders behind the banks, and each wanting to get the best out of it. “There could be some incentives given [by the government] as a sweetener to help the banks take that step,” notes an industry observer. Analysts say they don’t see major benefits from a three-way merger of these banks. “From Bank Islam’s point of view, the merger would solidify its position as the largest standalone Islamic bank. It would have access to all of BSN’s branches (over 400 nationwide), which is quite substantial and which I suppose, could be a positive. “For BSN, on the other hand, the merger would see it get a commercial banking licence. It would also possibly help diversify its funding base. As for Bank Muamalat, it gets to become a piece of a bigger entity. The merger would also help address the pare-down issue for its biggest shareholder DRB-Hicom,” a banking analyst tells The Edge. When DRB-Hicom bought its 70% stake in Bank Muamalat in a RM1.069 billion deal back in 2008, Bank Negara Malaysia had allowed the acquisition on the condition that it eventually pare down the stake to at least 40%. It has yet to do so. Attempts to sell a strategic stake in the lender, including to Malaysia Building Society Bhd (MBSB) early last year and to Bank Islam in 2011, did not pan out. “Frankly, I’m not too excited at the prospect of this three-way merger. I suppose the whole point is to try and get consolidation going, but really, it just creates an entity with a very big civil servant portfolio,” the analyst adds. Indeed, the biggest portion of each of the three banks’ financing goes toward home financing and personal financing, mainly for civil servants. An interesting point to note is that the merger would enable the banks to tap BSN’s automatic salary deduction — via the Malaysian National Cooperative Movement (Angkasa) — to collect monthly loan repayments from civil servants. Still, observers say it would take some time before any of the banks initiate moves to start merger talks. Bank Islam, for one, is on a growth path and while it is likely to be keen on an M&A with the right partner, nothing is likely to happen until it sorts out its own group restructuring. Its parent company BIMB is understood to be mulling a group restructuring that basically involves Bank Islam taking over its listed status. BIMB also owns 60% of insurer Syarikat Takaful Malaysia Bhd, which analysts speculate it could sell, and 100% of stockbroking firm BIMB Securities. “A merger of this size would result in a lot of job duplication, which means there’ll be layoffs, so I doubt it will happen anytime before an election, if at all,” says another industry observer. Competition in the industry is nevertheless heating up. Earlier this month, non-bank lender MBSB agreed to buy Islamic lender Asian Finance Bank Bhd for RM644.95 million in a cash-and-share deal that will help it clinch an Islamic banking licence. 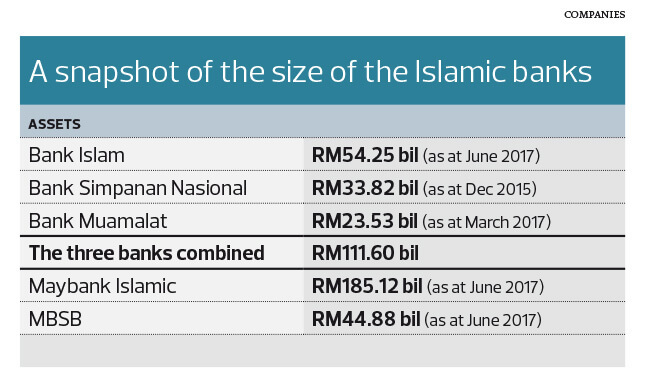 The combined entity, expected to kick off operations in the second quarter of next year with total Islamic assets of RM42 billion, will be the second largest standalone Islamic bank after Bank Islam. Bank Islam, the country’s oldest Islamic lender, made a net profit of RM530.96 million for the year ended Dec 31, 2016, (FY2016) up from RM507.26 million a year earlier. Its gross impaired financing (GIF) ratio is low, at 0.98%. Bank Muamalat, meanwhile, the smallest of the three lenders by assets, posted a net profit of RM149.91 million for the full financial year ended March 31, 2017, an increase of 13.64% over the previous year’s RM131.91 million. Its GIF ratio worsened to 2.31% compared with 2.21% a year ago, and is also higher than the industry average of 1.6%, which raises some concern about its asset quality. RAM Ratings, in a rating review report earlier in June, notes that the bank has fairly sizeable related-party exposures. “Bank Muamalat has a relatively large exposure to related parties, with exposures arising from credit transactions with these parties accounting for 61% of total capital as at end-December 2016 (end-March 2016: 67%). Some of these parties are also among recipients of the bank’s top 10 largest financing facilities, which stood at 14% of gross financing (end-December 2015: 20%). That said, none of the bank’s exposure to related parties was in default as at the same date,” it said. Bank Muamalat’s asset size stood at RM23.53 billion as at end-March. BSN, founded in 1974, is a DFI mandated by the government to provide commercial banking services to Malaysians, especially to marginalised communities. It provides a range of savings, wealth management, business and personal financing as well as card products, both in conventional and Islamic banking. According to its 2015 annual report, its latest that is publicly available, BSN has over 7,000 employees and over 9.1 million customers, with retail deposits amounting to RM13.6 billion. The group made a net profit after tax and zakat of RM115.12 million for the year ended Dec 31, 2015, a 27.34% decline from a year ago, on higher staff costs and other overheads. Its Islamic banking segment’s net profit was RM79.5 million on revenue of RM993.2 billion.